Guille and Debbie Mac Kenzie were born and raised in Buenos Aires, Argentina. Guille studied his first theological degrees in Buenos Aires, was ordained at the age of 24 and served for six years. In December 2008, they moved to St. Louis, MO, to complete a Master of Theology and a Doctor of Ministry at Covenant Theological Seminary. 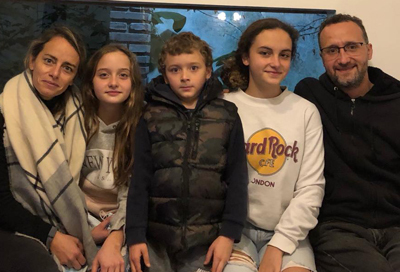 After returning from the States, the Mac Kenzie family returned to Argentina and started a new church plant in Buenos Aires. The church plant grew and later became the Spanish speaking congregation of a multicultural church called "Iglesia Presbiteriana Nuevo Avivamiento." Praise be to God! God has blessed Guille and Debbie with the joy of having three kids: Camila (12), Catalina (10) and Benjamin (7). "Nuevo Avivamiento" (New Revival) is a multicultural community with a strong desire to share our faith in God. We enjoy diversity having many nations represented with people coming from places as diverse as Taiwan (mostly), mainland China, Colombia, Ecuador, the Philippines, Japan, South Korea, the United States of America, Paraguay, Peru, and from Argentina, of course! The core group was developed with devoted Christians with a strong call to evangelism and church multiplication. The vision of the church is to develop a multicultural community of disciples of Christ who worship God, love one another, and bring light to the world. Key values of this church are spiritual vitality, strong discipleship program and community transformation. Promoting a permanent think-tank to reflect about the need to plant and revitalize churches towards the expansion of the kingdom of God and the transformation of society. Equipping pastors and leaders with an interest in church planting. We develop cohorts of church planters and leaders who meet bi-weekly. Sending and mentoring pastors and leaders with a call for church planting or revitalization. We are not yet involved in financial support ourselves, but come alongside church planters and pastors and help them raise their own support through different partners. Providing advice to churches that desire to assess their church searching opportunities for their own development or for planting a new church. We invite you to request and read the information package for Misión BETA including more details and ways in which you can be a partner. Buenos Aires is a globalized city of around 4 millions inhabitants, reaching 13 millions including the Great Buenos Aires suburban area. It is a very multicultural city that includes people from all continents. It is mostly Roman Catholic, although skepticism and indifference to faith and church are significantly increasing, especially in the context of the city. It also has one of the largest concentrations of Jewish and Muslim communities in South American countries. We strongly believe that both Nuevo Avivamiento Church and Misión BETA can make a great kingdom impact in this important city that spreads its influence towards all Argentina. We believe it is important for us not to be fully dependent on external financial resources. Thus we strive to receive support from national sources and complement our income raising funds. Due to a rampant economic crisis in Argentina this past year, local resources cover almost 50% of our needs, while we raise the rest from churches and friends through PMI. We also value and appreciate our praying partners. If you would like to pray for us, please ask us to include your email address in our emailing list to receive our quarterly prayer bulletin. You may subscribe to the newsletter at http://eepurl.com/dKx6Q.